Join in the $26,000 AVAST Recommendation Cash Giveaway! 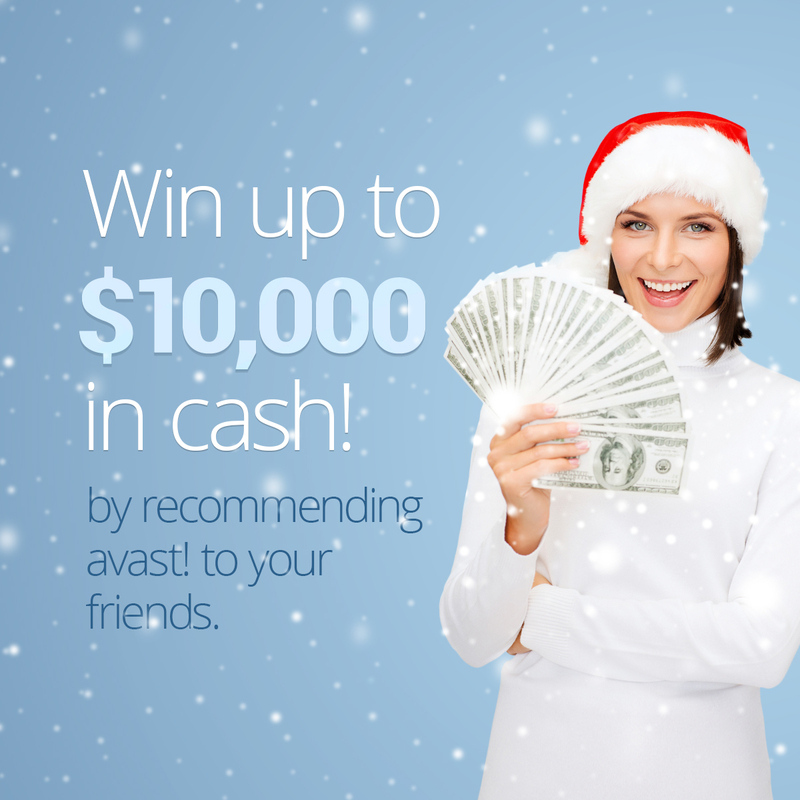 For a few more weeks, you can share AVAST to enter our Holiday Cash contest for the chance to win up to $10,000! Did you know that 60% of avast! Antivirus software’s new users come from a personal recommendation? That’s because our satisfied users tell their friends and family about avast!. I have recommended Avast to friends and family here in Kenya and abroad. I have been an avast! Internet Security subscriber for long and I have no words to express my happiness in the product. ~Abraham O. To thank all of you who share avast! with friends and relatives, we started a program where you can earn points to get a 1-year license for avast! Internet Security. Now, in celebration of our 25 years in business, we bumped it up a couple of notches, and we’re giving away a total of $26,000!! Share avast! with your friends. The top recommender in the world will win $10,000! The 6 top recommenders on their continent will win $1000 each! I do computer repair and install Avast Free on every computer that comes in my shop when they need an AV. Love your AV! ~Hestor T.
The 10 most creative ways to recommend avast! will win $1000 each! We still have loads of internet cafes in my country, and they are mostly filled with slow-, virus-infected machines. So whenever I check into one of these to print out a document, I simply install Avast Antivirus and run a scan. By the turn of the week, most cafe owners switch to avast, for which other clients and myself are most grateful (as are our portable devices). ~ Catherine R.
Do you know someone who could use avast! Free Antivirus on their computer? Share avast! with them today, and be in the running for part of the $26,000 cash prizes! 5. At AVAST we love creativity, which is why we'll also give away $1,000 to each of 10 people who recommend avast! in the most creative way. Go to the recommend section in your AVAST Account to send us an email showcasing your creativity. It's easy, so what are you waiting for? Start recommending now.